Love is in the air. This event will be a joint event with our InterNations LA group! 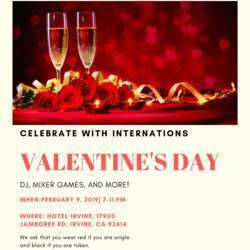 The event will include a DJ and FUN Mixer Games that will make it EASY to meet new friends. Adults of all ages are welcome. Valet parking will be free for the first 4 hours.